The 750 Motor Club's 2016 circuit racing season got off to a busy start at Donington Park on the 19/20 March, where all three of the new formulae were on track for the first time with healthy sized grids. As well as exciting racing from both outings of the Tegiwa M3 Cup, the freshly re-introduced Royal Purple Hot Hatch Series brought with it some unexpected drama. In the first outing, a succession of unlucky reliability issues plagued the new generation of Hot Hatch pretenders, opening the door for victory to be seized by Matt Howarth in a Mk3 Vauxhall Astra - a driver and car pairing from the previous Hot Hatch era. The inaugural Cartek Club Enduro race not only brought with it a grid full of club-level sports and saloon cars, but also offered thrilling competition from start to finish in a manner more akin to sprint racing than endurance. 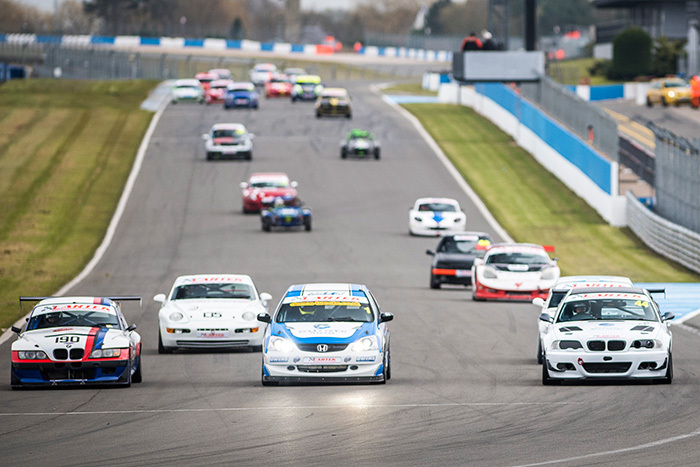 With some competitors from the popular Roadsports formula mixing it with Club newcomers and those looking for a fresh challenge, the event proved to be an immense success, filling the gap in club motorsport for an endurance series with manageable costs. You can find the full results from Donington on the 750 Motor Club website, as well as photo galleries from the event.